Fifteen families were affected by the crash. One family lost three children, and another two children and their father. It would take a week to get the DNA tests results that were done on the 18 pupils killed in a minibus taxi crash in Mpumalanga. "We would like to thank the DNA team for the work they have done. They have confirmed with the department on Sunday that they will need a week to finalise the identification of all these learners," said Gauteng Education MEC, Panyaza Lesufi on Monday. He was addressing pupils at the Mahlenga High School in Sokhulumi village, Mpumalanga. 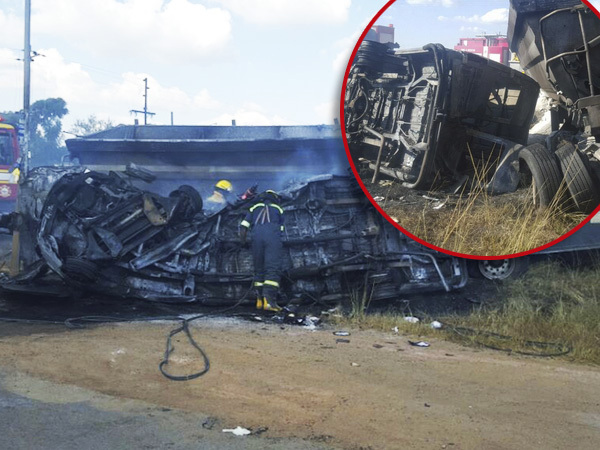 The 18 school kids were burnt beyond recognition when their 22-seater minibus taxi burst into flames after colliding with a truck on the R25 in Wolvenkop, Mpumalanga, on Friday afternoon. They were aged between 7 and 15. The minibus was carrying 27 people. Seven children survived and three of them were in a critical condition. The pupils attended the Refano Primary School and Mahlenga High School. Lesufi said the Mpumalanga and Gauteng provincial governments had established a joint funeral committee. It would announce details of both the memorial and funeral services in a week. One family had been granted permission to bury their child in KwaZulu-Natal. "We urge the other affected family members to work together with us." Lesufi asked the families of the victims to have sympathy with the family of the driver, Amos Mnguni (75) who was also killed. "Let's treat everyone as equals, including the family of the driver. We believe that it is very important that they get our support and they are also taken care of during this difficult process." Minister of Basic Education, Angie Motshekga told pupils that she and Lesufi were there to comfort the parents who were at work when their children died. "When the children enter through these gates, they become our children. Your children are our children; they are the nation's children. Even the President has sent his condolences," Motshekga said. She said the pupils were angels who had been called "home". "The one thing I love about teaching is that you are always surrounded by angels. They are still angels, but sometimes God wants his angels back. So we are here to be with you in person. We know this is difficult and that it's going to take time to accept what happened, especially the way they died," she said. Mpumalanga Premier David Mabuza also conveyed his condolences to the families. "I cannot imagine the pain the parents of these children are going through. We convey our deepest condolences. Their pain is our pain, and we will be with them during this difficult time in their lives," Mabuza said.